Finance services offered to savers leave them the responsibility to operate in accordance with moral principles, avoiding speculative activities even if within the limits of the different laws. 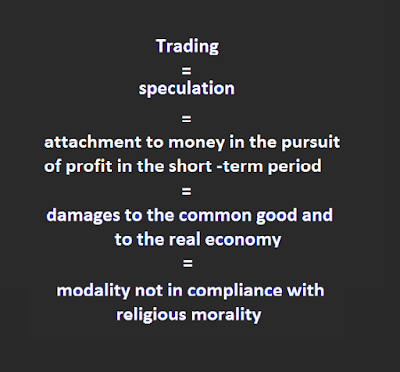 Individual speculators are not investors and in the moral context are considered socially useless and of damage for the common good. 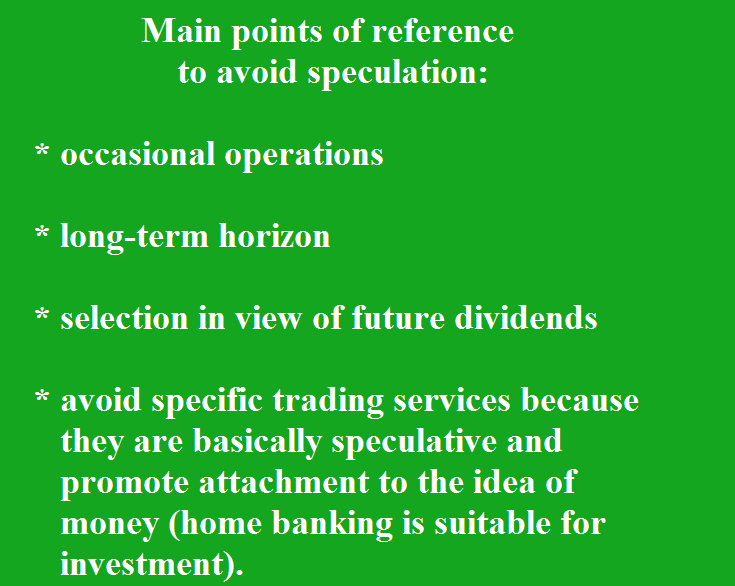 Trading is not investment but it is speculation; it is important to be aware of this distinction "speculation indicates transactions that are made for the sole purpose of getting a profit from changes in prices . In the case of operations on stock, purchasing and selling of assets are made with the purpose to gain money on changes in prices as soon as possible without any interest to maintain the stock in view of future dividends. Speculation is also of potential significant damage to the real economy. Conversely investment is carried out in the medium-long term perspective with the aim of obtaining a fair return through dividends without hazards on the expected returns on capital and avoiding a reprehensible attachment to money. (**) International Journal of Ethics , John A. Ryan., Catholic University of America. 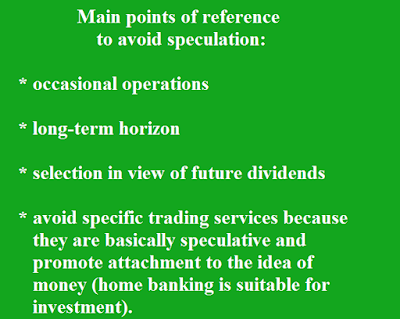 avoid any offers (even though legally admitted) which allow speculative activities. don't pay attention to daily prices indexes of the financial market because they are the basis for short term speculation and not investment. remember that each individual speculative transaction in the financial market partipates to the speculative structure that is of potential great damage to the real economy. 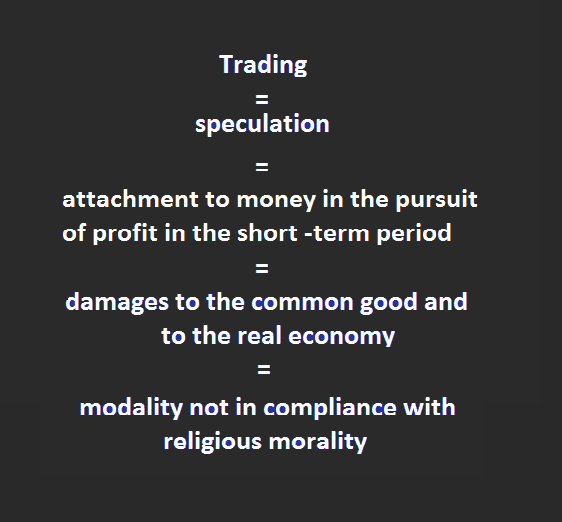 The attention should be focused on the above aspects which are of primary importance for a correct behavior from a moral-religious point of view regardless of any type of personal utilitarian approach through trading that causes attachment to money and easily may promote further reprehensible behaviors. Also, any individual speculative transaction by means of trading increases potential significant damage to the common good.